Salvation And Survival: What Is The True Meaning of Christmas? Today, millions of Christians around the world will look upon this day as a celebration of the birth of our Lord and Savior, Jesus Christ. I do not intend to get into a lengthy discussion of whether or not December 25th is the actual day of Jesus's birth; or even try to persuade anyone of the pagan roots of this holiday and its establishment by the Roman Catholic Church. There is enough evidence and historical documentation of this fact that I believe it is each Christian's duty to be a good Berean and study the Word for themselves, and then make up their own mind as to how (and when) they are to acknowledge the birth of our Lord. Today, I choose to remember what Scripture tells me the day of the Lord's birth means... no matter what day it actually was. I choose to cling to the words of the angel of the Lord, who said, "Fear not: for, behold, I bring you good tidings (news) of great joy, which shall be to all people. 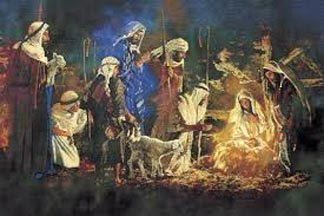 For unto you is born this day in the city of David a Saviour, which is Christ the Lord." Note that the great joy shall be; it is a future event -- the day when that baby in the manger would die on the cross for our sins; that is the day that He would become our Savior, paying the price for our transgressions. And then an angel with a multitude of the heavenly host praised God, saying, "Glory to God in the highest, and on earth peace, good will toward men." So, for me, today is the day that I honor God for coming in the flesh, and setting His plan in motion to restore my relationship with Him. Even the shepherds, after finding Mary, Joseph, and the baby Jesus, returned to whence they had come, "glorifying and praising God for all the things that they had heard and seen, as it was told unto them". I sometimes wonder if we get so caught up in the emotion of an innocent baby being born, that we forget the purpose of that baby was to die for us. He was born to be exalted at His death, which points to our salvation and resurrection... that is a radical, but true statement, and makes His birth even more astounding. And yes, the facts of His birth are extraordinary and incredible: born of a virgin; conceived by the Holy Spirit; the supernatural gift of a loving God to His broken children. The birth of this Savior was prophesied for centuries; foretold in the Old Testament and fulfilled in the New. Today we celebrate God's appearance on earth as an innocent baby, and the expression of His love, mercy, righteousness, holiness, compassion, and glory -- all present in the Christ child in that Bethlehem manger. May you know the joy and the hope that His birth signifies, and may we soon sing praises of His glorious return! On this day, may you know and experience the Peace of God and His Good (and Perfect) Will towards all men.